Abusa'id Abolkhayr or Abū-Sa'īd Abul-Khayr (Persian: ابوسعید ابوالخیر‎‎) (December 7, 967 - January 12, 1049), also known as Sheikh Abusaeid or Abu Sa'eed, was a famous Persian Sufi and poet who contributed extensively to the evolution of Sufi tradition. The majority of what is known from his life comes from the book Asrar al-Tawhid (اسرارالتوحید, or "The Mysteries of Unification") written by Mohammad Ibn Monavvar, one of his grandsons, 130 years after his death. 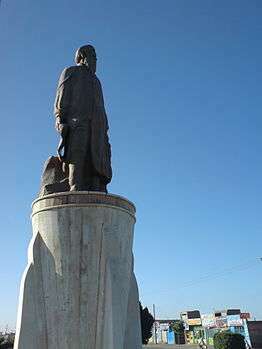 Statue of Abū-Sa'īd Abul-Khayr in Nishapur. Abū-Sa'īd was born in the village of Mihne, part of Greater Khorasan, today located near Torbat-e Heydarieh in Khorāsān-e Razavī Province. His father was a herbalist and physician with an interest in Sufism. He then moved and lived a few years in the city of Nishapur, and subsequently moved back to Meyhaneh after a few years. 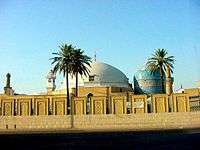 Abū-Sa'īd’s formal education included Islamic scholarship and Arabic literature that he continued until the age 23 when he left them for Sufism. The main focus of his teachings is liberation from “I”, which he considered the one and only cause of separation from God and to which he attributed all personal and social misfortunes. His biography mentions that he would never call himself "I" or "we" but “they” instead. This idea of selflessness appears as Fotovvat (a concept very near to chivalry) in his ethical teachings and as Malaamat, a kind of selflessness before the Beloved which he considers a sign of perfect love in his strictly mystical teachings. Both of these concepts in a certain sense are spiritual forms of warrior ethics. Despite their simplicity he believed that the full application of these teachings to one's life requires both divine grace and the guidance of an experienced Sufi, and is impossible through personal efforts alone. His picture as portrayed in various Sufi writings is a particularly joyful one of continuous ecstasy. Other famous Sufis made frequent references to him, a notable example being the Persian Sufi poet Farid al-Din Attar, who mentions Abū-Sa'īd as his spiritual guide. Many miracles are attributed to him in Sufi writings. Many short Persian poems are attributed to him and he is considered one of the great medieval Persian poets. The attribution of these poems has always been doubtful and due to recent research, it is generally believed that he wrote only two poems in his life. The attribution of so many poems to Abū-Sa'īd was due to his great fondness for poetry. His love for poetry can be seen from the fact that he usually used love poetry written by non-Sufis in his daily prayers. Even his last words were a poem, and at his funeral instead of the recitation of Qur’anic verses, he requested the following poem. Another example of the poems attributed to him.